A wonderful side dish that will compliment any meat entrée you choose to serve! In a large mixer bowl, combine the cream of potato soup and sour cream. Add the minced onion, salt, pepper and melted butter or margarine. 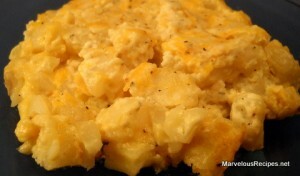 Stir in the hash browns and cheddar cheese. Spread mixture into a 9×13-inch baking dish. Bake, uncovered, at 350 degrees F for 45 to 55 minutes or until bubbly. Makes 8 servings. Sounds delicious and easy! I’ll have to give this one a try.